This is a romantic comedy set in Paris about a family that goes there because of business, and two young people who are engaged to be married in the fall have experiences there that change their lives. It’s about a young man’s great love for a city, Paris, and the illusion people have that a life different from theirs would be much better. The scenery of Paris was captured beautifully ,the city really came to life. The movie ended quite abruptly ,you will feel like more could have been done. Ernest: If it’s bad, then I hate it because I hate bad writing. If it’s good, then I’ll be envious and I’ll hate it all the more. Midnight in Paris is a very nice movie . 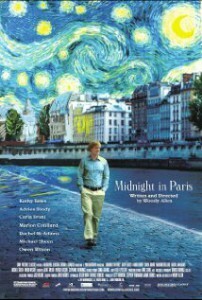 Woody Allen writes a great screenplay that contrasts a person’s life with their dream. He wonderfully illustrates ones unappreciative attitude towards the life and era they live in in a humorous/witty way . It is the type of movie that leaves you with something to think about at the end . It asks the question if we are satisfied with our lives in the present ,because we always reminisce and thing of our “golden years” . You hear people complaining about today’s music and how much they miss the “golden oldies” ,but if you were to go back in time to ,say , the 80’s . The people of that time would also be reminiscing of the music of the 60’s . Great rereview, I agree with aall your oobservations, but you didn’t mention the glorious soundtrack that contributes to the parisen atmosphere. Great Movie that you would never get Bored Watching.